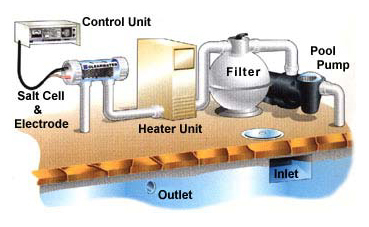 Salt water chlorination is a process that uses dissolved salt (2,500–4,000 ppm) as a store for the pool chlorination In order to achieve this concentration, the chlorine generator (also known as salt cell, salt generator, salt chlorinator) uses electrolysis to break down approximately 200-500 pounds of salt. The resulting chemical reaction eventually produces hypochlorous acid , and sodium hypochlorite , which are the sanitizing agents already commonly used in swimming pools. As such, a saltwater pool is not actually chlorine-free; it simply utilizes a chlorine generator instead of direct addition of chlorine. 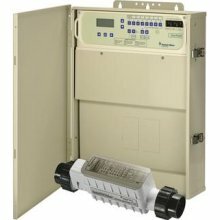 Accurate Pool & Spas uses the IntelliChlor® Salt Chlorine Generator which will produce all the chlorine a pool needs, safely, effectively, and automatically. Same sanitation performance as manual chlorine addition without the drawbacks. No need for you to buy, transport and store chlorine compounds. Ability to communicate with IntelliTouch®, EasyTouch®, and SunTouch Automation Systems. Accurate Pool & Spa will work hard to get you the pool of your dreams, and we don't stop until you have the backyard that is the envy of the neighborhood.. Our business revolves around customer referrals. We only use the best equipment and proven construction techniques which is why every customer is completely satisfied.